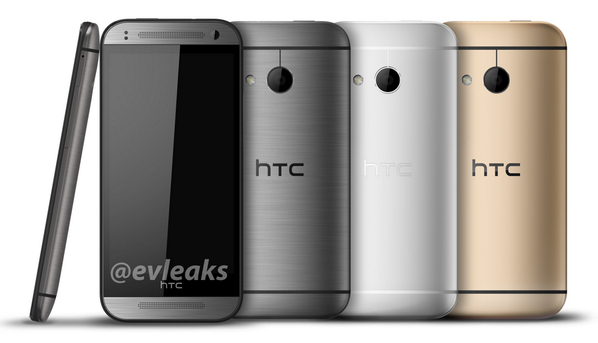 A smaller version of the HTC One M8 dubbed the One Mini 2 is reportedly in the works and won’t have the unique second camera of its big brother. Instead, the One Mini 2 has a traditional single camera sensor on the back, according to a leaked image of the handset published by noted tipster @evleaks. Aside from the second sensor, which measures depth during photo-taking, the HTC One Mini 2 looks just like the company’s flagship phone, save for a single LED flash; the HTC One M8 includes two LEDs. A pair of front-facing speakers is shared between both phones, as is the rounded metal unibody case. The lack of a depth sensor isn’t too surprising, as most “mini” versions of flagship phones aren’t just smaller but are less expensive as well. As a result, costs are cut by removing sensors and using less-capable components. I’d expect the HTC Mini 2, for example, to use a 720p display and a middle-of-the-road processor that’s slower than the Snapdragon(s qcom) 801 inside the HTC One M8. Without the second camera sensor, HTC could also remove some camera options from the Mini 2. It would be more difficult, although not impossible, to change the image focus after a picture is taken, for example — a feature that’s available in the HTC One M8.